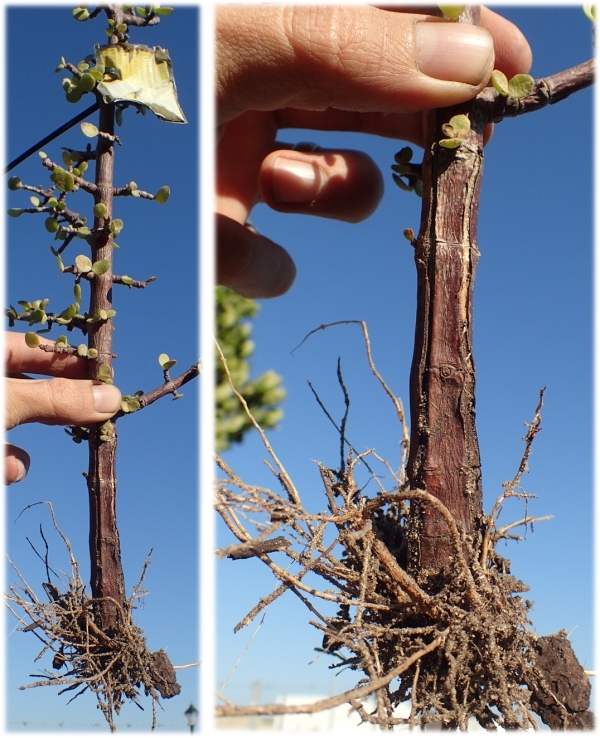 Spekboom rooting — testing the stem-damage hypothesis. In a previous post (To the root of the problem...), I highlighted that the roots of planted truncheons invariably only grow from the very base of the stem — thus, rooting takes place 15-20 cm below the soil surface where the stem has been cut. This was based on a few field observations that have been bolstered by digging up many more plants (must be over 50 by now, all in very different environments). In that same post, I suggested that damage to the stem was required for roots to develop. Together with Nicholas Galuszynski, we had an Honours student conduct a series of treatments to determine if this stem-damage for rooting was correct. Unfortunately, the Honours student left with all the data (another lesson on data management for me), so I'm left with a few photos — but the results are, nonetheless, quite clear. Control, where the truncheon was cut and planted with no addition damaging. Vertical slits, where two shallow vertical slits were cut (quite shallow: <0.5 cm) for ~10 cm length-ways along the stem ending at the base where using the sharp blade of a pair of secateurs. Horizontal slits, where a number of horizontal slits were cut (also shallow) cross-ways across the stem. Deep gouging, where deep cuts were gouged into the stem. And the overall results are summarised below with photos of single replicates. However, there was some swelling at the base with more (visually assessed) root biomass. 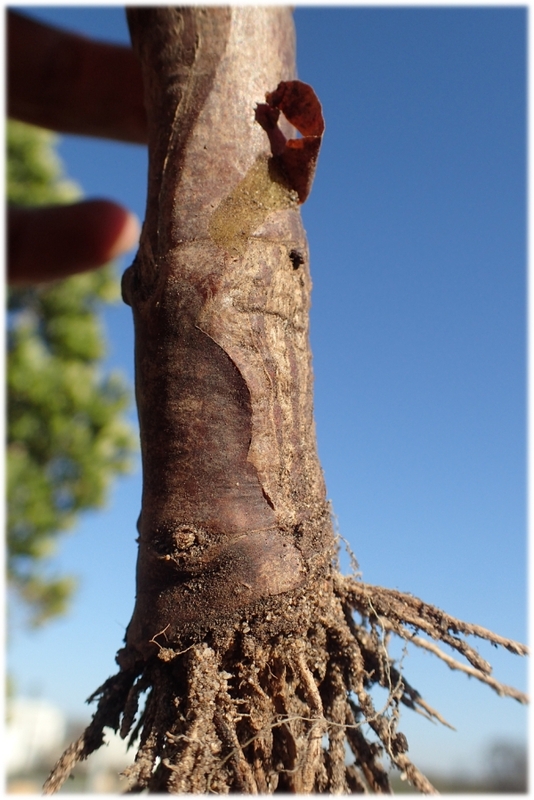 Rooting was consistent across stems with gouges, but not every gouge developed roots. Nonetheless, those that did not develop roots still healed over. So, the deep gouging makes a substantial contribution to stimulating rooting. The great thing about these results is that they've been replicate by an independent experiment! 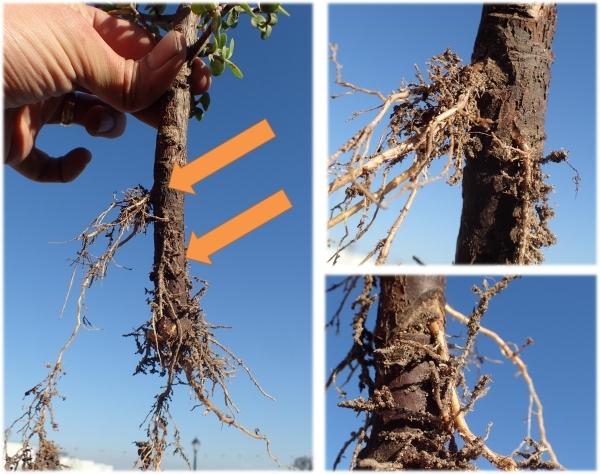 Thankfully, Yondela Norman — an Honours student at Rhodes University — conducted a completely independent and different experiment on rooting (at the same time as we were!) 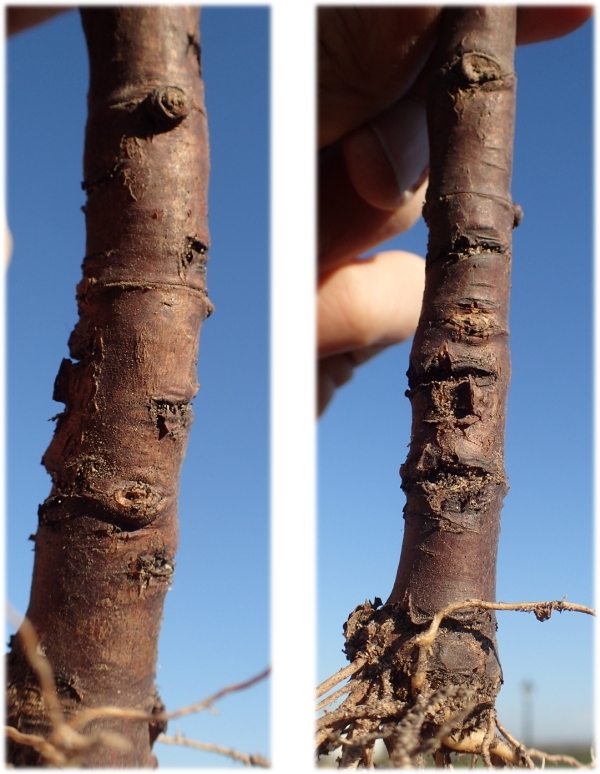 and also found that the deep gouges substantially promoted root growth. So, my predictions in this earlier blog were correct. It's great when the data actually supports a hypothesis. 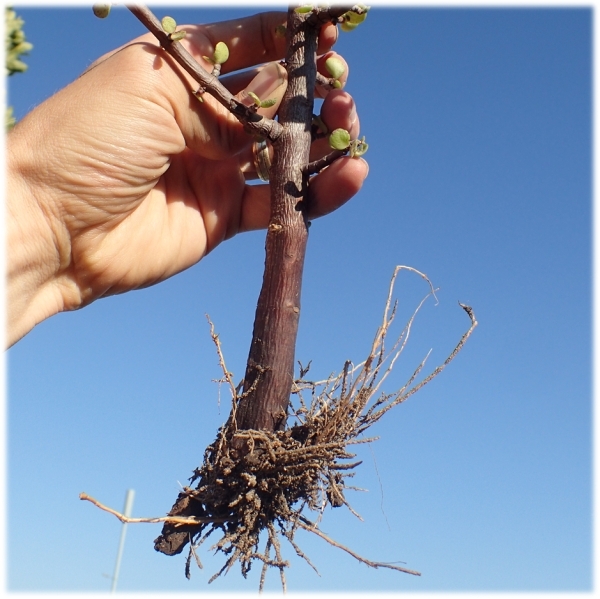 Thicket Restoration: Is Spekboom the only answer? 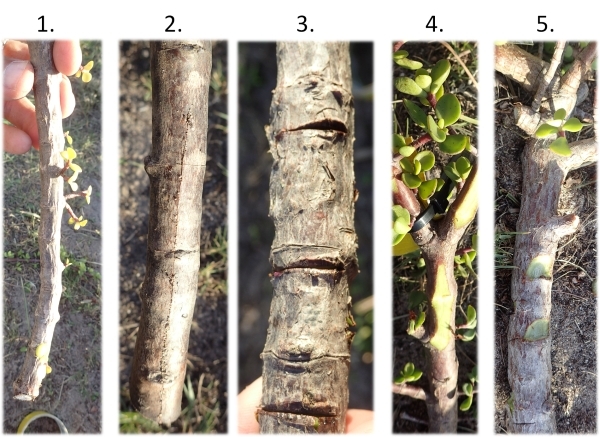 Restoring thicket has largely focused on using Portulacaria afra (spekboom), and to a much lesser extent on "late-successional" tree species, as the agents for returning ecosystem functioning. I write "late-successional" because we are a far way off from understanding the successional patterns in thicket; nonetheless, the case is quite well established that, in arid thicket, the presence of many tree species — such as Pappea capensis — is due to the presence of spekboom (e.g. van der Vyver et al., 2013). This is largely due to the increase in available soil moisture that is a by-product of a spekboom dominant layer (van Luijk et al., 2013; Wilman et al., 2014). However, does this necessarily mean that spekboom is the best pioneer species to re-introduce or bolster into degraded lands? Recent field observations lead me to think that we might have overlooked an pioneer candidate: Crassula tetragona. While looking investigating a donga (a dry gulley formed by erosion) in Addo that was surrounded by dense intact thicket, it struck me that although there were plenty of spekboom plants in the vicinity (e.g. the orange arrow in the picture below), I could only find one small individual in the donga — although, I argue elsewhere (The number one invasive species in arid lands globally: Spekboom?) that this is due to a lack of an adequate dispersal agent. 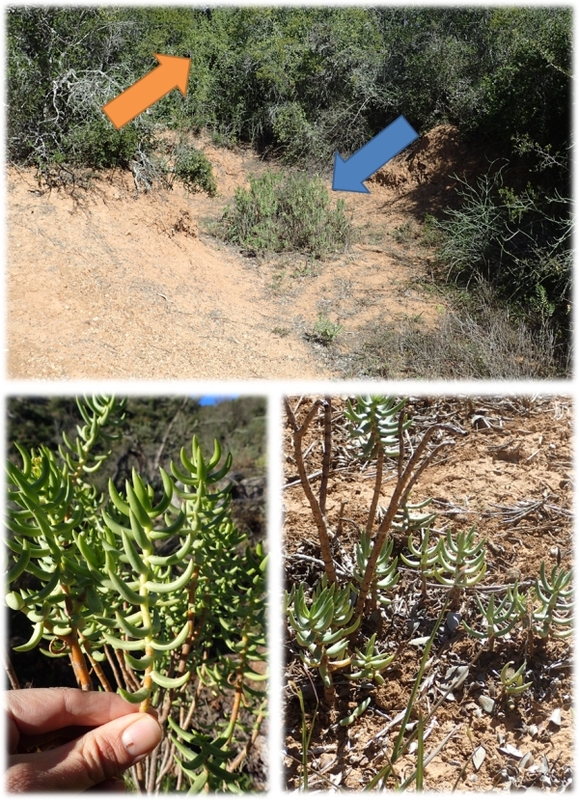 What had colonised this inhospitable environment was Crassula tetragona (blue arrow in the picture below). Also, where it had colonised, colonies of clonelets were forming wherever leaf-clusters had broken off the parent plant. This clump is acting as a silt and litter trap, with the soil already at least 5 cm above the surrounding soil. 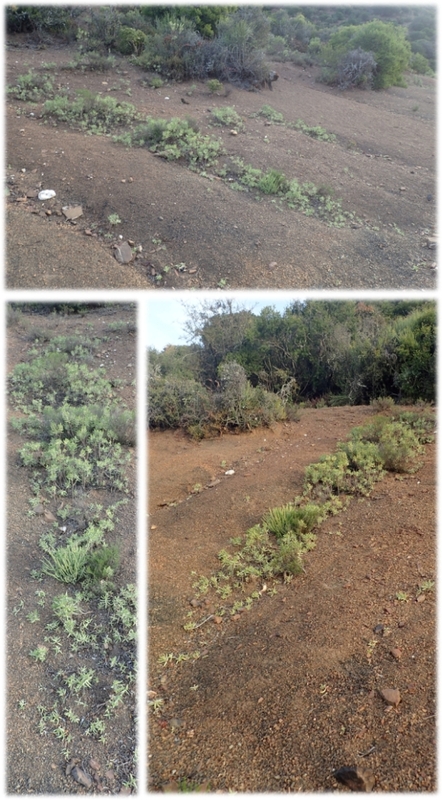 This is an example of spontaneous rehabilitation and C. tetragona is changing the microclimate of this eroded donga testing. However, this is in a herbivore-exclusion area and along a drainage line where there will be some moisture and soil (the donga had not hit bed rock yet). How will this species fair in a harsher environment? Well, the images below were taken from Kaboega Private Game Reserve on a heavily eroded north-facing (and so hot!) slope. There is no topsoil - it is right down to the eroding shale bedrock. The light green plants in the image below are C. tetragona. These plants are filling up the small rills on a slope where all the topsoil has been stripped off — and they are doing it via vegetation growth: a crown piece gets knocked off (falls off? ), and this readily takes root. This is an environment where a range of herbivores are present, including kudu and impala. Why is it not being eaten? This species is likely to be unpalatable (however, Curtis & Perrin, 1979, do list it as a preferred species for rodents). In discussing this as an option with Jan Vlok, he highlighted that this is a species that does not do well in areas with high herbivore activity due to trampling. So some activity is okay, but not too much. Given that this is a species that has is readily self-propagating across a range of arid and hot environments, it should certainly be considered as part of the rehabilitation suite. Coupling this with erosion control measures, such as mini-ponds, could provide the boost to create vegetated hotspots. van der Vyver ML, Cowling RM, Mills AJ, Difford M (2013) Spontaneous return of biodiversity in restored subtropical thicket: Portulacaria afra as an ecosystem engineer. Restoration Ecology 21:736-744.
van Luijk G, Cowling RM, Riksen MJPM & Glenday J (2013) Hydrological implications of desertification: Degradation of South African semi-arid subtropical thicket. Journal of Arid Environments 91:14-21. Wilman, V, Campbell EE, Potts AJ & Cowling, RM (2014) A mismatch between germination requirements and environmental conditions: Niche conservatism in xeric subtropical thicket canopy species? South African Journal of Botany 92: 1-6. I had the unusual pleasure of attending an awards ceremony for researchers and lecturers where the guest speaker, Dr John Kani, berated us in an unstinting barrage of uncomfortable truth. His voice, as unique as that of Morgan Freeman, captivated us as he poured his scorn and derision upon the state of the country — and how the universities are, in part, to blame. An interesting choice of topic to an event aimed at celebrating research, teaching and engagement — but an entirely necessary call to arms. Scientists — what is it that you actually do? Dr Kani highlighted that scientists get so wrapped up in their private worlds [and usually only hang out with other scientists] that they forget to explain what it is they do and why it is important. But worse, we don't give much thought on how to make our research accessible to the lay person, or school children. We publish in rarefied journals that the even the most ardent of non-scientist science enthusiasts will a. battle to understand, and (even worse) b. won't have access to [locked behind publisher paywalls]. He shares the story of the selection committee for the prestigious Order of Mapungubwe battling to understand what it is that any given scientist has done that may warrant the bestowing of such an award. If we cannot (do not?) share our research findings with the public at large, then what is the point of science? I feel that this point is spot on: we cannot expect non-specialists to rise to the level of specialists (who have spent years learning the theory and jargon). It is the specialists who need to rise to the level of simplicity [Einstein had much to say about simplicity!]. Universities — why are you so quiet? Another point that that he raised was that Universities have, in his view, shied away from politics and advising government. He makes a good point: where are the qualification specially designed for councillors and others in public service? Surely it is the universities who have the responsibility to create the diploma and degree benchmarks to ensure that those in public service are qualified to serve the public. Dr Kani relates the historical narrative of the NATS gaining power, based on a large part to the argument of the Afrikaans culture being under threat of erosion or extinction — and within a few years (six?) it was possible to study from pre-primary all the way through to University in Afrikaans. The NATS did this by pouring money into this agenda — i.e. into Universities, the Arts etc. Dr Kani believes that no such effort, nor commitment, has been made by the current government, and that universities have accepted this. Universities have not made a strong enough call to demand to be the agents of change for the country. [Rather, the funding for universities has declined without much active outcry which led to the burden being passed onto students]. Dr Kani left us with a challenge: be the driving agents of change in South Africa. We have the most powerful tool available — education. Given the new name of Nelson Mandela University and the university's slogan, "Change the World", this message could not have come at a more appropriate time. It is time to to turn the ivory towers into the pillars that support a better nation.